I've kept a series of journals since childhood. While my record keeping regularity runs in fits and starts, if I have a big move or a broken heart it's a certainty that I will be journaling about it. One of my favorite books on the profound results that come through journaling is Julie Cameron's The Artist's Way. If you are an aspiring writer or artist, chances are great that you've read TAW or at the very least are familiar with Morning Pages, a delightful writing excercise created by Ms. Cameron in which you are encouraged to write three pages every morning to unload baggage, unblock, and clear the way to create. My collection of journals has ranged from a big beautiful red leather journal that I filled with postcards of my travels to a one dollar composition book I recently bought at Target (shown in the pictures here). Some of the big journals chronicled years of my life. Recently I've worked with a series of slim, short-term journals that I chose to use for a specific trip or project. For instance, last September when I spent a month in Evergreen, I brought with me a new brown leather journal that I wrote in every morning before I went to my computer to spend the rest of the day editing my second novel. 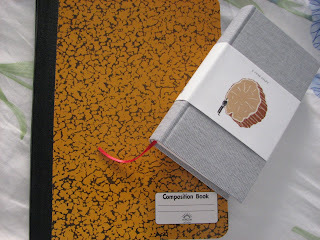 I found that I liked these 'special purpose' journals because they allowed me to encapsulate in one place, all my experiences in that short period. At the beginning of this year, I grabbed an unassuming spiral bound notebook and used it to record my year of goal setting, the inspirational books I was reading, and what I hoped to achieve. I took it to the beach with me every Sunday when I would spend the day reading and journaling. The notebook was so well used that its cover has now fallen off, yet I know that years from now I will look through those modest pages and recall fondly the days of wonder that it represents. Two weeks ago I bought I the two journals pictured above. One, as I mentioned, is an inexpensive composition notebook that I bought at Target for a dollar, I loved the cover's elegant simplicity and the nostalgia that a composition notebook brings to mind. 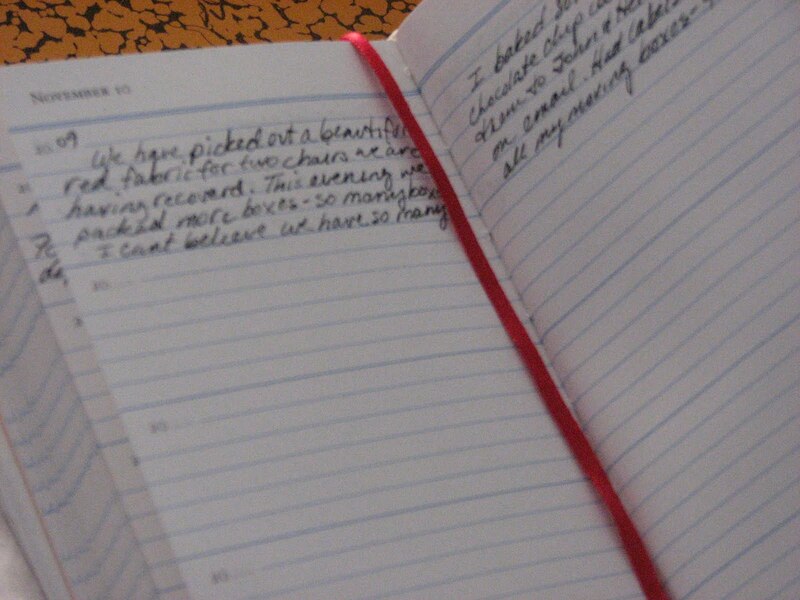 The second journal is a five year diary, a concept I'd never heard of until I read a mention of it in The First 30 Days. Each day of the year is allotted one page that is in turn divided into five paragraphs, one for each year. As you can see, it's small size forces you to write just a few sentences about the day. However, over the course of five years it allows you to look back and see where you were on that day in the past without refering to another journal. This novelty with the added challenge of encapulating my thoughts in a small space is intriguing and I can't wait to see where it leads over time, especially since I've never stayed in one place more than four years at a time. (Already I'm thinking that someday I'd like to retire in New Zealand). Interestingly I thought I'd save both of these journals and begin them in December, after I landed in Colorado. But my enthusiasm got the best of me and I thought it would be equally interesting to record the details of my move...and I just can't stand going so long without a place to record my thoughts, especially at such a momentous time. Journals provide a personal space to record our growth, and to express thoughts and feelings in private when we may not be have an outlet for them in public. As I've described above, they can also provide a platform for special projects, a place to set goals and plan our attack and record our successes and setbacks. I'm guessing that you, my fellow blogggers, are also journalers...please share how you use journals in your own life and describe your favorite journal! Been doing morning pages for quite awhile now. When I am steady about it and do it every day, first thing, it has a profound effect on my life. Have gotten away from it the last month or so -- thanks for reminding me about the importance of it. I love this idea of writing a paragraph to summarize each day, or each day's thoughts or mood. I'm going to see about finding one of those. Thanks for the tip! I love notebooks and journals of any kind. 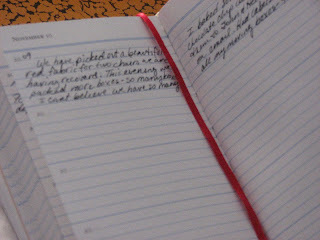 I like the overpriced moleskin ones and inexpensive ones with fun designs from the dollar store. Totally love journals, not the online one. They help me keep track on things that need to be done. they are so cute too and can be carried wherever we go.